Steve Miller is such a staple of classic rock radio it’s easy to forget that deep down, he’s also a Texas bluesman. 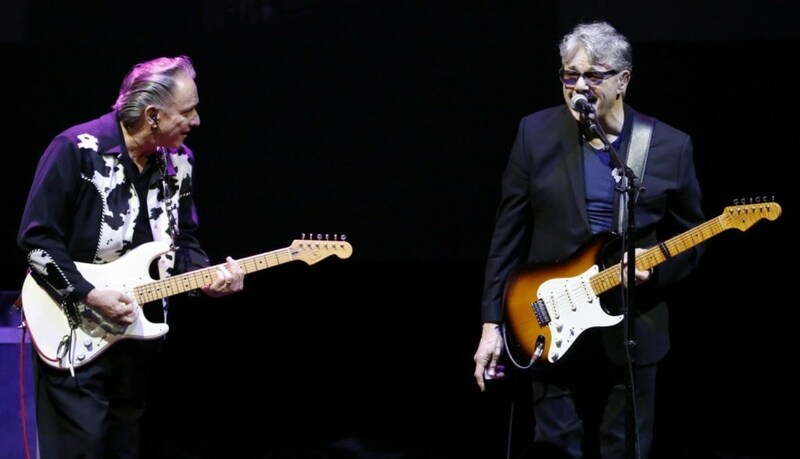 Monday night at Verizon Theatre, he dug back into his roots with a vengeance and a strong assist from Dallas blues master Jimmie Vaughan. The show’s high point arrived when Vaughan came back after opening the show to trade guitar solos with Miller on a triad of classics: Little Walter’s “Blues with a Feeling,” Otis Rush’s “All Your Love (I Miss Loving),” and “I’m Tore Down” by Big D blues legend Freddie King. Vaughan is clearly the better player and improviser of the two. He says more in four notes than most guitarists do in 40. Yet Miller was no slouch either. Bending notes like B.B. King and tossing in British influences that Vaughan tends to avoid, Miller easily kept up with his duet partner as they took turns burning up the strings of their Strats. With a little more rehearsal, these two could easily turn their blues bit into a whole show. He used that story as a springboard into yet another blues classic, Johnny “Guitar” Watson’s 1957 gem “The Gangster of Love.” In spite of all the remakes, Miller found time to cover most of the bases of his own discography, too. Backed by his longtime four-man band and anchored by the fiery-fingered keyboardist Joseph Wooten, Miller dug deep into The Joker album for lesser known tunes like “Shu Ba Da Du Ma Ma Ma Ma” before ending with a barrage of ’70s radio hits including “Fly Like An Eagle” and “Rock’n Me” – not blues songs per se, but tunes that certainly bare the imprint of someone who knows the genre inside out. As usual, Vaughan let the music do the talking during his opening set. He never once mentioned his recent Rock and Roll Hall of Fame performance or the news that the city of Dallas has agreed to erect a public memorial to him and little brother Stevie Ray in Oak Cliff’s Kiest Park.